Visual schedules for children with autism have long been used at school and in therapy to help improve a child’s sense of control, independence, flexibility, and ability to cope with change. Why? Because children with autism thrive on routine and predictability. They often engage in repetitive behaviors and thought patterns, and have difficulty coping with unforeseen changes in their daily routine. Kids with autism prefer to do the same things in the same order, and while this certainly helps them maintain a feeling of control over their environment, these obsessive tendencies can become quite limiting over time. Visual schedules teach children that the order of activities can change from day to day. By having a visual representation of what their schedule will look like, they can come to their own understanding of how their day will play out, and can learn to look to the schedule to help them know what is expected of them and when to move from one activity to another. As the name suggests, a visual schedule is a visual representation of a sequence of events that is created using pictures, icons, words, etc. Most classrooms use a basic schedule outlining the different activities students will be participating in throughout the day, but visual schedules for children with autism take things a step further by providing a more detailed outline of exactly what will happen from one moment to the next so a child can be prepared ahead of time. Why do visual schedules work for children with autism? Children with autism struggle with unstructured time more than their neurotypical peers, and can find it particularly difficult to move from one activity to another. They may become visibly agitated and overwhelmed, express feelings of sadness and anger, and some may erupt into a full-blown meltdown when they feel a lack of control over their lives. Visual schedules for children with autism have been shown to reduce these feelings as they help kids anticipate events ahead of time and plan for changes in their routine, allowing them to be more flexible. Kids with autism also sometimes lack the ability to communicate appropriately with those who care for them. Some are completely non-verbal, and visual schedules can help them communicate basic needs as well as tell those around them when they want to participate in a certain activity, which can significantly decrease feelings of anxiety and frustration for both the child and the caregiver. Determine which type of visual schedule your child needs. Since no two children with autism are the same, the type of visual schedule you choose for your child should be based on her individual strengths. Forget about works for others, and focus on what will work for your child. Does she learn better through pictures or written words? Kids with non-verbal autism may prefer object-based visual schedules that use simple household objects to signify different activities – a fork for eating, a colored ball for play, a brush for hygiene, etc. – whereas verbal children may prefer written phrases or words. Consider how your child reacts when she’s feeling stressed or anxious, and choose a visual schedule you feel she would be able to work with while exhibiting those feelings. Decide how long the schedule should be. While some kids may prefer to have their entire day mapped out for them, others may find this way too overwhelming. If this sounds like your child, a morning, afternoon, and evening visual schedule may be a better option, or you could have a before school, during school, and after school template. Beginners may need to start with something simpler, like a ‘first, next, then’ visual schedule with only 3 activities listed (these work best when the last activity is a highly desired one). Don’t be afraid to test a few different options to find out what works best for your child, and remember that her needs may change as she matures. Set up regular reminders. In order for visual schedules to work, children need to remember to look at them throughout the day, and finding a way to prompt your child to do this is paramount to ensuring visual schedules are a successful tool for her. If you’re using a picture-based schedule, this could be as simple as you handing your child a flashcard with a picture of the schedule on it so she is prompted to check to see what’s next on her agenda. For older and more independent kids, you can use a timer (I love the Time Timer as it helps visually represent the passage of time, which is a difficult concept for all children to learn) or set an alarm in her smartphone. Again, you’ll have to play around with a few different options to find something that works for your child. Teach your child how to use a visual schedule. This step is definitely the trickiest, and if it takes time for your child to grasp how to use a visual schedule, remember not to be discourage. Keep at it as the long-term benefits will outweigh the short-term pain. A good way to get started is to use a visual prompt to tell your child it’s time to use the schedule. Next, place the schedule in her hands and direct her from behind so she is focusing on the schedule and not on you. Once you’ve helped identify the first task on the schedule, help your child make her way to where she needs to be and ensure she stays there until it’s time to prompt her to look at the schedule to see what’s next on her agenda. Continue working with her until she understands the concept, and then begin fading your prompts so she can use the visual schedule independently. Remember that children with autism are creatures of habit and feel stressed and anxious when their routine changes unexpectedly. In the event that something unforeseen crops up, make sure to add it to your child’s visual schedule as soon as possible to help prepare her ahead of time. The more warning you provide, the more flexible she will be. The beauty of using visual schedules for children with autism is that they can be as simple as you need them to be. You can make your own, download one of the made free visual schedules available online, and there are heaps of ready made visual schedules you can buy on Amazon and in specialty shops that sell tools for kids with developmental delays like autism. Whichever option you choose, the key to making it successful is working with your child to help her grasp the concept behind it. Remember that your visual schedule doesn’t need to be perfect, and the time and/or money you put into creating a visual schedule for your child will be time saved in dealing with meltdowns and behavioral problems moving forward. There are HEAPS of great printable schedules and routine cards available for download online. Some are completely free, while others are for sale for a small fee, and I’ve rounded up a combination of both below to help get you started. I tend to prefer the paid options as they are more visual pleasing and include a lot more in the way of visual routine cards (and they typically go for only $3-$5), but if you’re just getting started with visual schedules, you may want to begin with the free options to help get your feet wet. Regardless of which option you choose, you will need a printer to print off the routine cards, and I suggest investing in a laminator (we own a Fellowes M5-95 Laminator and I’ve had nothing but success with it), velcro dots, and a velcro board so you can create a substantial visual schedule you can use over and over again. Pocket charts are another great option to consider! Don’t have time to print, laminate, and setup your own visual schedules for children with autism? No worries. Amazon has a TON of great ready made options you can purchase, and I’m sharing 7 of my favorites below. With a double-sided dry erase magnetic board and 72 routine magnets catered to daily routines, weekly extracurricular activities, daily and weekly chores, and more, this visual schedule can be easily customized for kids of all ages and abilities. What I love about this visual schedule for children with autism is that it includes everything you need to make your own Velcro schedule, and it can be used both at home and on-the-go. It includes 132 routine cards focused on home and school routines, as well as different therapies, and it includes a self-adhesive binder strip so you can add it to a 3-ring PECS binder. If you’re looking for a basic chart you can hang in your child’s bedroom to remind her what steps she needs to go through each morning before leaving for school, this is a great and inexpensive idea to consider. If you’ve already got a pocket chart – or velcro dots and a velco board – and want a bunch of real-life photo cards to help you make your own visual schedules for children with autism, this is a great resource to consider! With 2 display boards and 30 home-based widgets, you can create all kinds of easy-to-follow routine charts for different parts of your child’s day with this set. If your child has a tendency to dawdled in the mornings and/or you are trying to find ways to foster more independence in her daily routine, this is a simple, yet effect chart to help break down the steps needed to get dressed independently. With 175 visual cards to choose from, this kit helps you create both daily and weekly schedules for your child, which will save you time and help ensure she’s prepared for any foreseen changes in her routine well in advance. 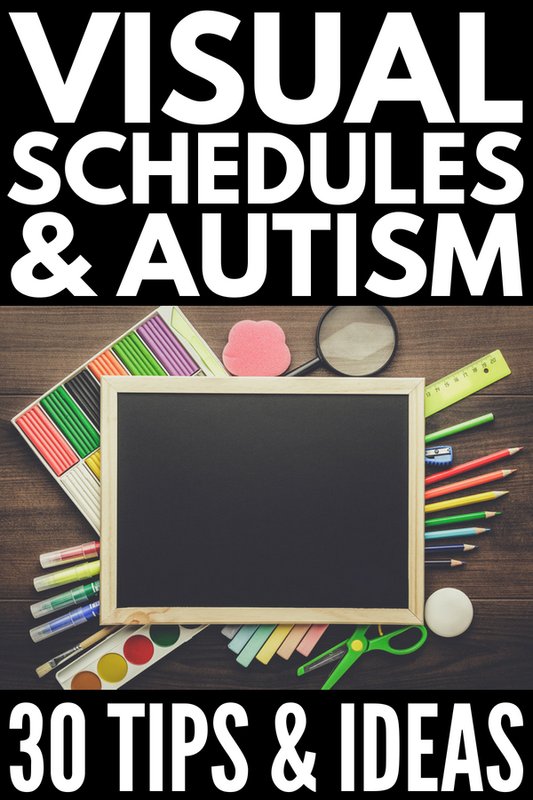 Whether you’re just getting started with visual schedules for children with autism, or just need additional ideas to inspire you to take your current setup to the next level, I hope the ideas in this post prove useful to you and the exceptional children in your life! If you found this collection of visual schedules for children with autism helpful, please share this post on Pinterest! And if you’re looking for more autism-related tips and tricks, please follow our Autism and SPD board where we share all kinds of helpful ideas we find each day!